Unlike any book you’ve read before, Open Hue is in the business of making pretty book-turned-lamps that literally brighten up your day whenever you open them. We came across perhaps the most literal book lamp in lighting history with this range of book-turned-lamps from Bangalore decor brand, Open Hue. 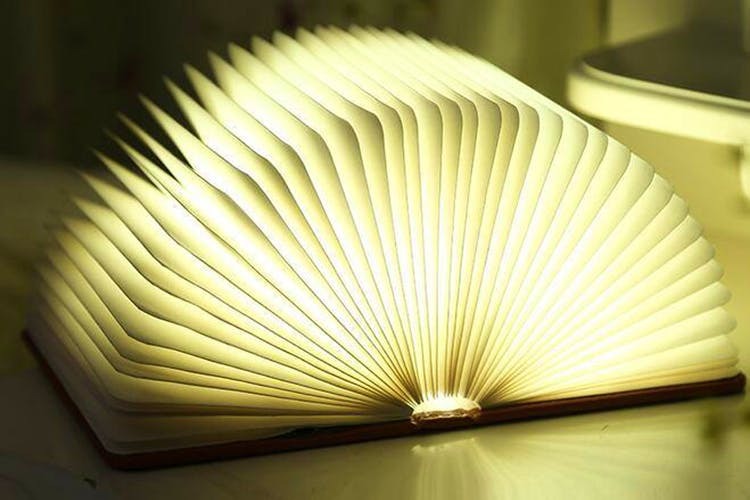 These portable books, that weigh less than a pound, light up every time you open them. Taking mood lighting to the next level with it’s soft and ambient glow, these lamps create a cosy and comfy atmosphere in your space. With upto six hours of battery life and a slick USB cord that recharges them completely in 2 to 3 hours, these lamps are as functional as they are pretty. The books open up a full 360 degrees and their magnetic wooden covers let you stick them onto any metallic surface, giving you an endless list of decor possibilities. What’s more? These lamps make for the perfect gift as you can get them personalised and engraved with a message. Available in two sizes, the mini and the classic, it’s time to lighten up your space with these quirky lamps. Open Hue is planning to add an extra feature to their lamps which allows you to recharge your phone, so keep a lookout for that.